Stainless steel hardware. Only 316 stainless steel fasteners & staples are used on our pontoon boat seats. Overall Pontoon Seat Width: 28"
I'm looking at your Premium 28" Bench seat. Can I get it with just one single color without the accent stripes? Unfortunately, no. We do not make any customer colors. What we have listed on our website are the only options that we have available. I am not finding the seats in the length that is currently on our boat. Do you make seats to length needed? Unfortuantely, we do not offer any Pontoon Furniture that contains A Livewell built it. We are looking into if for the future. But at this moment we do not offer the Livewell in our Pontoon Furniture. are the base included with each pontoon seats? Yes. 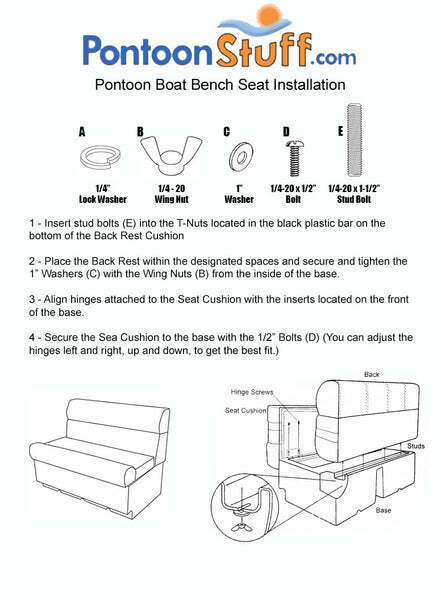 These Pontoon Boat Seats come with a sturdy plastic bases along with the Back Rest Cushion and Seat Cushion. 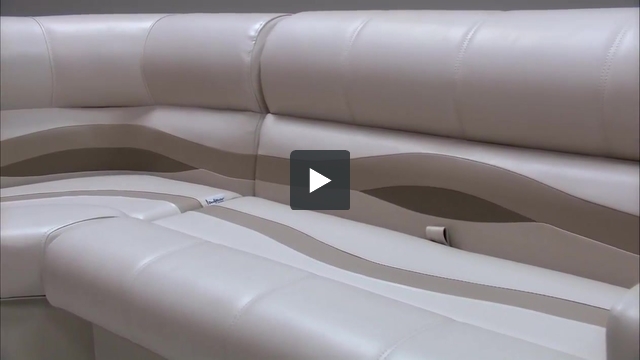 Both our classic and premium line of pontoon furniture are made with the same materials. The main differences is the amount of foam used and the sew pattern on each pontoon seat. Unfortunately, we do not offer free standing seats outside of our Bucket Seat and Reclining Captains chairs. Those would be place on a pedestal. Do you have the weight of each piece? This product weighs about 58lbs for all 3 pieces. On the Premium seat description it says "Stainless steel hardware. Only 316 stainless steel fasteners & staples are used on our pontoon boat seats". However, when I looked at the Classic seats it does not list that. Can you tell me what they use on the Classic. Our Premium and Classic Furniture use the same exact hardware. I can assure you that these will be the same. We do not offer 48" seats. Unfortuantely, we do not offer cushions by themselves. You will need to have this 28" Bench supported by a railing of some sort. They are not free standing seats. Hi There, I have a Tracker Pontoon and I need a 20" Bench seat. Is it possible for a custom length seat? This 20" Bench Seat along with the 28" Corner Seat would be a perfect fit. Unfortunately, we do not offer custom Pontoon Seating. We only offer the seating size on the website. Does the 28â bench seat have storage? Do the corners have storage. I see the longer seat cushions flip up to access storage compartments. Also what is your return policy if simply donât like the seats but they are unused? I was surprised at the quality of the material and design of the furniture, it looks better than the factory furniture the boat came with. I have always received top rated customer service from the staff (which seems to be rare these days) and shipping times are very good. Assembly was simple and very easy to put together. The price compared to the quality is very fair. I would purchase this furniture again and would recommend it to a friend. I have 2 of these benches on my pontoon. They are very comfortable. Very easy to clean especially with the 303 cleaner from this site. Just keep them wiped down with protectant and they will last a lot longer than my old wood seats.